MARSHVILLE, N.C. -- Gary Christian of Birmingham, Ala., rolled in an eight-foot birdie putt on the last hole to win the $8,000 first-prize check Thursday in the Tarheel Tour's Eagle Chase Classic at Eagle Chase Golf Club. 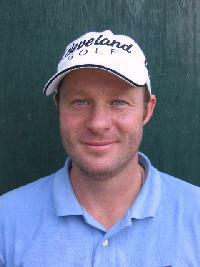 It was the 26th professional victory for Christian, who grew up in England and turned professional after his senior year at Auburn in 1995. Christian's last-hole birdie gave him a 67 on the day and left him at 11-under 205 for the tournament. He finished one shot ahead of Kiawah's Rich Mudd, who also shot 67 and was in the clubhouse at 206 when Christian made his final birdie. Despite his agressive putt on the 18th hole, Christian said he was not aware he needed another birdie for victory. "I purposely didn't look at the scoreboard. I've learned the hard way too many times," said Christian. "It takes a little pressure off you because you're trying to make birdie anyway. I was fortunate to put a good roll on the ball and knocked it right in the middle." Christian decided to play the Tarheel Tour this week after four straight unsuccessful attempts to Monday qualify for the Nationwide and PGA Tours. "I was averaging under 68 in the qualifiers and I didn't make one event," he said. "It's nice to know you've got three rounds to make up for any mistakes." Mudd wound up in alone in second place when Fernando Mechereffe of Charlotte missed a 9-foot birdie putt on the last hole while playing with Christian. Mudd pocketed $4,000, while Mechereffe's 69 put him in third at 207 and earned him $2,250. Ryan Zylstra of Ontario, Canada, and Nathan Bertsch of Sunset, S.C., both closed in strong fashion to tie for fourth at 209. Zylstra fired a 67, while Bertsch shot 68. Each earned $1,875. Amateur Sean Moore of Marshville, who plays collegiately at Wake Forest, shot the day's low round, a 66, to jump into a tie for eighth place. Moore, the first amateur to make a cut in Tarheel Tour history, collected $750 in gift certificates, the maximum allowed an amateur under USGA rules. "I hit the ball great every day, I just didn't make any putts," Moore said afterward. "Today, a few more putts fell in." The Tarheel Tour is off next week before traveling to the Sandhills of North Carolina for the Anderson Creek Open, which is June 21-23 at Anderson Creek Golf Club in Spring Lake, N.C.